It’s not hard to see why Violet might be a little angsty. After all, she’s got practically no friends, the other kids told her she’s weird, and she’s stuck in a really unlikable, creepy house. It’s mostly work and no play for Violet. She reads, cleans house, cooks, and supervises a bunch of refugees. On top of that, she has no boyfriend. Until the creepy wolf-elves show up, the only boy of her age who seems to exist is her conceited, irritating cousin, and of course she can’t be with her cousin. No wonder I always imagine her with a sort of glare on her face. I mean, that’s no life for a teenage girl. Sometimes Violet seems to like it. At least, I think she does, in which case the whole situation of her family being friends/enemies/slash friends again with a bunch of uptight, hysterical non-humans warped her personality. Still, everything in Renari has a pomposity to it that doesn’t always seem deserved. After getting kicked out of that house—good riddance, perhaps I should write a sequel in which she comes back to Vailsgabel and deals with the fact wolf-elves were MURDERING her family for literally almost forever—she travels to see a king who is bitter because he’s been boring for so long people are discarding him. Then they drift to a musty old ruin and rave about how beautiful it is and how it represents something amazing, when it looks pretty shady actually. With great ceremony some nomad with a veil is proclaimed king and they act as if this is the culmination of everything great in recorded history. I mean, it’s a nice idea that he gets to come home and no one is begrudging him that, of course. But sometimes fantasy can be overserious, that’s all. Maybe that’s an okay thing, in the end, once you admit it. And there will be more updates. Jane Austen. There's nothing quite like her. She continues to inspire us all these years later. This Valentines Day, myself and a few authors came together to bring a special sale and giveaway. Twelve books are on sale for $2.99 or less. 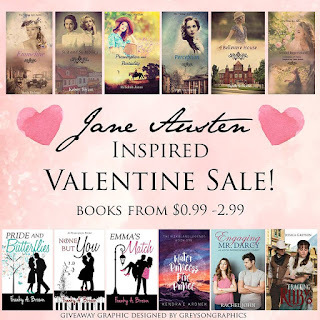 Books like Tracking Ruby and Water Princess and Fire Prince, feature characters who adore and quote Jane Austen's stories. Most of the books take the beloved classics and retell them in a new setting. Each book is perfect for those who want a little touch of Jane Austen and romance for this Valentines Day. 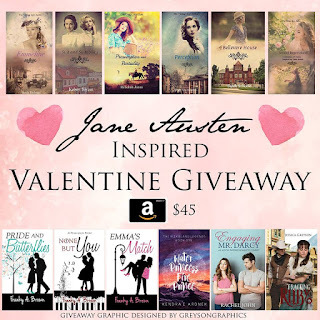 An author's participation in this giveaway does not mean they endorse all the books included. While all books are considered clean, they may not reflect the values of the other authors. In the last couple of weeks I got on BookBub and reopened my Goodreads author account. Since the Goodreads profile hasn’t been active in 3 years and the BookBub one just got started, I don’t have a lot of views there yet, but you can drop by and follow me if either of these are sites where you are active. I still have a number of followers on Goodreads from before, but after such a long hiatus, they stopped listening to my posts although my blog still syndicates into the profile. Nonetheless, I decided to return so I could keep my books in order because new books are automatically added to Goodreads and I want to keep track of them. Not sure yet whether BookBub offers anything for me, but I also wanted to keep my books in order there. You can follow me on Book Bub here and on Goodreads here. Everything on BB looks fine. My books on Goodreads are a mess because I can’t change the book covers, many of which are outdated, or some of the book’s information. However, I did make a shelf for “authorsbooks” and here’s the link to it so you can quickly add them to your Want to Read list. Ryan and Essie isn’t on the list yet, but all the others on my website are. Since it's Christmas and my brain is too full with managing the holidays to think of a blog post over the weekend, I'll just take a hint from my CD player and list my favorite (and least favorite) Christmas songs.